I’m not in a wheelchair and my children don’t have cancer, so let’s call it a draw. I hope you choke on the way out. That was the whole thing. Nothing could be added or subtracted. It was complete and perfect. Then as a side effort, I started a “what I learned this year” list and monkeyed with it over a couple more months—thinking of new things, taking them out when I remembered I’d actually learned them in 2009; feeling confident that certain items weren’t too personal or petty, thinking later that they were; deciding that petty’s no good and some of the personal has to go, but other personal might be okay with the right sound effect—and now it seems like the thing I should post instead, even though my reflections today are different in tone and outlook—yet again—from those of a month ago. But this took a long time to write, so let’s just count those toward 2011. How to make a hollandaise. 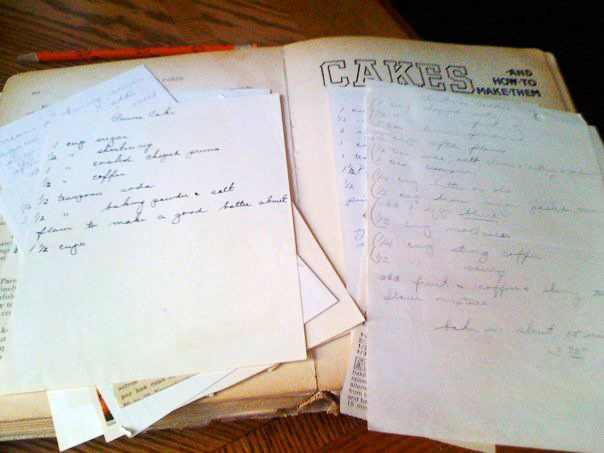 I found this recipe handwritten on yellowing notepaper in one of her old cookbooks, which I hadn’t cracked open since taking it from the trim, bare study in their house in California. Metal desk, plain walls. They were frugal people, and he had been a “layout man.” A tool-and-die shop craft. I have a small stack of his ancient job-hunting postcards around somewhere: When Your Layout Man Is Stuck, Trust to “Know-How,” Not to Luck. The cuckoo clock was in that study, too. I remember being shown the clock every time we visited when I was little. And some helixes he’d made out of cardboard tubes, mounted upright on plywood bases with the angles between the cut segments noted in black ink. Grandma died years ago, and I don’t remember why I finally took down Woman’s Favorite Cook Book (“She should study her guests, as it were; should allot the charming talker to the equally charming listener, and the opinionated person to the passive and yielding disposition…”) and opened it.